Cyber security is well-established on board agendas today. However, the fact that so many businesses are still suffering major data breaches shows that organisations are struggling to turn awareness and concern into effective action. 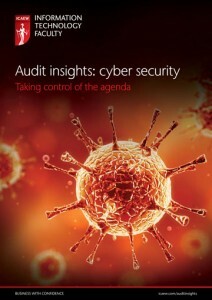 This slow pace of change is increasingly frustrating governments and regulators and so the ICAEW 2016 Audit Insights: Cyber Security report urges business to show more urgency and take control of their cyber agenda before regulators do it for them. The fourth Audit Insights: Cyber Security report in the series focuses on why change in this area seems to be so difficult, and highlights how organisations can get on top of their cyber risks more effectively. Seeing cyber risks as real and dynamic – cyber risks are constantly changing as technology develops, businesses transform and attackers find new ways of striking. Boards need to recognise this pace of change in cyber risks. They also need to make them real and specific, rather than just entering ‘cyber risk’ on a risk register. Taking behavioural change seriously – despite years of cyber security training and awareness campaigns, it is proving difficult to embed the behavioural changes needed to support effective cyber processes. Our report argues that businesses need to link cyber risks more clearly with business objectives and operations, and attach more significant consequences where staff fail to comply with policies, in order to make change stick. Recognising cyber security as a precondition for operating – although a digital infrastructure underpins many business activities, most organisations only consider cyber risks as a bolt-on activity. Our report argues that adopting an approach of cyber-by design is critical to changing this way of thinking. By designing everything with security in mind, good practices simply become part of the job. The report suggests a variety of approaches that can help boards take more control of the cyber agenda. It also provides some key questions for boards to ask themselves and their cyber security specialists. What do you know about specific threats to your business, including the actors and their possible methods? How can your critical data actually be accessed, and by whom? What employee behaviour is unacceptable because of cyber risks? Do you see yourselves as role models for good cyber behaviour? Are new products and services designed with cyber risks in mind?